Summary: An unforgettable debut about a young woman's choice between the future she's always imagined and the people she's come to love. 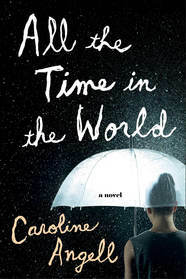 I wasn't quite sure what to expect when I picked up ALL THE TIME IN THE WORLD by Caroline Angell. Obviously, I was interested enough in the plot to read the novel; and I'm really glad I did. I was immediately caught up this novel, and I both cried and rejoiced as the main character dealt with tragedy and, in the process, rediscovered her passion. ALL THE TIME IN THE WORLD tells the story of Charlotte, an extremely talented musician and composer who ends up working as a nanny for an Upper East Side Manhattan family. After someone Charlotte trusted betrays her in a very bad way, she decides that she needs a break from her music career. She ends up taking a job being a babysitter to two adorable little boys, George and Matty. Charlotte ends up loving these two kids as well as the entire family, and she learns that she is good with kids -- really good. When an unthinkable tragedy occurs, Charlotte realizes that George and Matty needs her now more than ever. She immerses herself into their lives at the expense of her own family and friends; and she begins to realize that she just might have to give up her musical dreams for these two little boys... and their dad. I loved ALL THE TIME IN THE WORLD -- it was so smart and refreshing! I loved the relationship between Charlotte and the boys, and I also appreciated all of the challenges that Charlotte faced. I found the characters in this novel to be very real, and I loved how the story worked all of my emotions. I actually did cry for Charlotte and the family, but I also celebrated Charlotte's little joys and her path to self-discovery. Despite sounding like a sad story (and don't get me wrong, it was really sad! ), I have to mention just how funny and playful this book was. Needless to say, I wasn't really expecting this. Charlotte is a young woman living in New York, and I found her dating experiences to be rather entertaining. In addition, as many moms will know, taking care of kids can provide a few chuckles, especially (in hindsight) when it comes to missing toys, puking incidents, and toddler tantrums. One thing that definitely impressed me about this novel was the way the story was told. The novel is written in Charlotte's voice, which is absolutely perfect with its honesty and purpose; and it really helps readers relate to the character. In addition, the novel goes back and forth in time starting with the tragic accident, back to when Charlotte first met the family, further back to her time as a graduate student, and to the future when Charlotte and the family were forced to adapt to their loss. It might sound confusing, but it wasn't at all -- again a testament to the author. In fact, I think the back and forth between time periods made for a fast paced story and definitely kept the novel moving. As I was "along for the ride" with Charlotte, I was concerned that the ending of this book would be a disappointment. I wasn't always confident that Charlotte would find her way. I don't want to give too much away, but I will say that I was happy with it -- more than happy with it. I loved the life lessons that Charlotte learned. I loved that she realized what was important in her life. And I loved that she was able to find some happiness and contentment. I do think ALL THE TIME IN THE WORLD would make a terrific book club selection. I didn't even begin to touch the depth of this novel. It does have a lot going on and, therefore, would make for a great discussion. There is a reading guide with fourteen thought-provoking questions. Some of the themes you might want to explore include parenting, grief, loss, friendship, betrayal, forgiveness, passion, marriage, relationships, money, family, and self-discovery. ALL THE TIME IN THE WORLD was one of my favorite books of the summer. Highly recommended to readers who enjoy literary fiction and especially coming-of-age stories for adults! This sounds like a wonderful, emotional read! I can't wait to pick it up. I think I would enjoy this one. This sounds like a really good book - thanks for the review!